BetCave Casino is an online gaming and betting site offering instant play and flash casino games to its players. It is owned and established by OddsMatrix Limited Casinos in 2010. This darkly themed online site is registered and licensed under the government of Malta which provides strict regulations on its implementation - prohibiting any US players from playing on the site's games. EveryMatrix, Blue Gem Gaming, and Rival Gaming are the software developers used by the site. These developers provide the site with exceptional casino games ranging from classic slot games, interactive video slots, conventional table and card games, video pokers, progressive jackpot games, 3D arcade games, and many other games. BetCave's wide array of slot selections have gained them the popularity among their players. The site offers 3 different categories which include classic three-reel, interactive five-reel video, and their exceptional selections of iSlots. These feature themed games, bonus-focused, and extraordinary game storylines. Some of these include popular game titles like Grandmas Attic, 5 Reel Circus, Cream of the Crop, Doo-Wop Daddy O, Roll Out the Barrels, Flying Colors, As The Reels Turn, A Switch in Time, Baby Boomers Cash Cruise, and Bowled Over. The site also offers conventional table games such as Blackjack, Craps, Baccarat,, Caribbean Stud Poker, Red Dog, Pai Gow, and many more. They also feature specialty and 3D games like Keno, Tiki Treasure, American and European Roulettes, Crazy Jewelry, Gunslinger's Gold, Mr. Magoo, and Penguin Payday. They also offer several video poker games such as Double Joker, Deuces Wild, Tens or Better, and Jacks or Better. Another site attraction is their selection of progressive games which offer huge amounts of jackpots and rewards to its players. Some of the most popular progressive titles are Major Moolah, Money Magic, Million Reels B.C., and Strike Gold. BetCave's bonuses and promotions also entice its players. The usual welcome bonus is offered to its new players after their initial deposits. New players are also granted with free game chips which are deposited directly to their accounts. Other site promotions include wagering incentives to its players. Players who wagered at least $1 receive 1 comp point on their accounts. Every 1000 comp points accumulated is equivalent into $1 cash which may be withdrawn or deposited on the player's account. 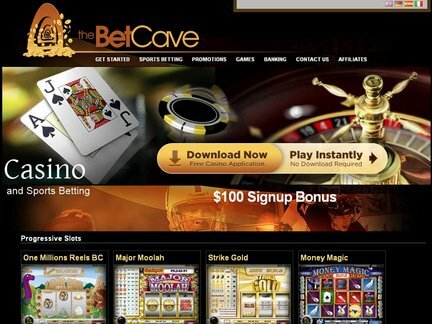 However, several online casino review sites have reported that BetCave Casino has been closed down and is no longer active on the gaming industry. This is due to some issues raised by its players concerning the site's unethical practice, non-payment of players' winnings, and delayed payment transactions. With these alarming issues, BetCave earns a 2 out of 5 rating for their poor site management and slow resolutions on the said concerns.